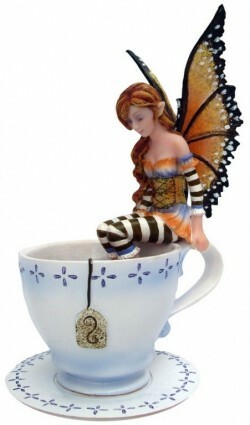 Delightful figurine featuring a fairy perched on the rim of a teacup, dangling her toes into the warm brewing tea. Decorated with warm orange tones and contrasting striped tights and sleeves. Designed by Amy Brown, a popular fantasy and fairy artist born in Washington, United States. She uses distinctive watercolour to create beautiful figurines with excellent detail and colour. Arrives boxed securely within high density protective polystyrene casing.